Mesothelioma is difficult for doctors to diagnose because it can be easily confused with other diseases. Even after a cancer diagnosis has been recognized, mesothelioma looks similar to other types of cancer in diagnostic tests. A biopsy and immunohistological analysis is needed, and even then other indicators are factored into the diagnosis, given the morphological variations that mesothelioma can appear in. Your first step after receiving a mesothelioma diagnosis should be to discuss your case with your doctor. It is useful for the person diagnosed with mesothelioma to create a list of questions, including those from his or her family. Ask your doctor questions in different ways until all your questions have been answered. Following are some common questions that may arise after a diagnosis of mesothelioma. What, exactly, is my diagnosis? There are three forms of mesothelioma, pleural mesothelioma affects the lining of the lung; peritoneal mesothelioma affects the lining of the abdominal cavity; pericardial mesothelioma affects the lining around the heart. You'll need to know the official definition of your cancer, so you will be able to communicate with other medical professionals at a later date. A more detailed description of the diagnosis process and the stages of mesothelioma. Ask your doctor how your diagnosis was determined. The only reliable test for a mesothelioma diagnosis is a tissue biopsy. Fluid biopsy is not considered reliable, since in the case of mesothelioma, the fluid tests negative a high percentage of the time even though cancer is present. A good question to ask is, "How accurate are the tests that diagnosed my disease?" Following discussion of your diagnosis, your doctor will most likely recommend the next steps you should take. If your diagnosis came from your primary doctor, he will most likely refer you to an oncologist (cancer doctor) for further analysis and treatment. If the doctor you are seeing is an oncologist, he will recommend a course of treatment and explain why he or she feels that specific treatment is best for you. It is always in your best interest to get a second opinion when dealing with mesothelioma. Although general oncologists are extremely competent doctors, they may not see the number of mesothelioma patients that a specialist sees, and may not have the most current information on treatment options. Perhaps the best place to get a second opinion is from a National Cancer Institute designated Comprehensive Cancer Center. You will find a list of these centers at www.mesotheliomaweb.org in the section on "Comprehensive Cancer Centers". Will my doctor be offended if I get a second opinion? No reputable physician will question your right to a second opinion. This is particularly important if your mesothelioma was discovered by a doctor without much experience with the disease. Mesothelioma is sufficiently rare that patients would benefit by seeing a specialist. What type of treatment is available to me? Once you have a second opinion and have perhaps gathered information on your own, you are ready to make a treatment decision. Time is always of the essence. The longer you postpone deciding on a course of treatment, the more likely your options may diminish. In early stage disease, surgery may be a viable option. If you are not a surgical candidate, chemotherapy is often offered. The Comprehensive Cancer Centers also offer a variety of clinical trials, which are the most recently developed investigative therapies targeting a particular disease. If a particular course of treatment is recommended, ask your doctor to explain the pros and cons of that treatment. Also, ask whether other options are available, and if so, why he chose the treatment offered. If fluid has collected in the chest or abdomen, your doctor may initiallly drain the fluid out of your body by putting in a needle into the chest or abdomen and use gentle suction to remove the fluid. If fluid is removed from the chest, this is called thoracentesis. If fluid is removed from the abdomen, this is called paracentesis. Your doctor may also put drugs through a tube into the chest to prevent more fluid from accumulating. See our description of the types of mesothelioma treatment. You should avoid unconventional, or scientifically unproven alternative treatments. Although you may hear these treatments have helped some people, they are not backed by sufficient scientific data to prove their effectiveness. Consult your doctor, the National Cancer Institute, or the American Cancer Society if you are unsure whether a treatment is unconventional, investigative, or standard. Bear in mind that unconventional treatments differ entirely from investigational treatments. Also, be assured that doctors do not disapprove of complementary treatments which address psychological or nutritional approaches that improve a patient's physical or emotional well-being and are used in conjunction with proven therapies. Where should I be treated and by whom? Once you have made a decision on a course of treatment, you must determine where that treatment is to be carried out. If you have opted for a specialized surgical procedure or clinical trial, chances are you may need to be treated at an NCI-designated cancer center by a specialist skilled in a particular area of expertise. This often raises concerns about travel to facilities which may be hundred of miles away. Organizations such as The National Patient Travel Helpline offer information on all forms of charitable, long distance medical air transportation as well as information on hospitality houses nationwide. You can also access information for travel and lodging at cancer centers in the of this website. Standard treatment, for instance a standard form of chemotherapy, can most likely be carried out at a local hospital by one of your diagnosing physicians. Even if you received specialized treatment at an NCI-designated center, it is possible that your specialist may work co-operatively with your local doctor. Whoever you choose to carry out your treatment, it should be someone with whom you can find a comfort level and who will welcome your questions and answers them in a manner that is easily understandable. Remember though, that a good "bedside manner" is no substitute for expertise. How can I make the most of my medical appointment time? Open communication between you and your doctor is key. Bring a prepared list of questions to each appointment, including those about new or continuing symptoms, side effects of treatments and how to manage them, or other information you have come across through talking with family and friends, by reading, or on the Internet. If your doctor seems unwilling to answer your questions, don't hesitate to press for a response. It is to your benefit to be proactive in your care. A proper diagnosis is essential before treatment begins. A doctor should be seen if a person experiences shortness of breath, pain in the chest, persistent coughing, or pain or swelling in the abdomen. 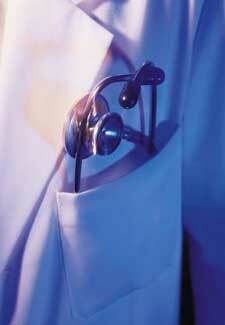 The doctor may order a chest x-ray or CT scan or fMRI as the first step in diagnosis. If these imaging techniques show a suspicion of cancer, further tests may be ordered. The doctor may examine the chest cavity with an instrument called a thoracoscope. An incision is made through the chest wall and the thoracoscope will be placed inside the chest through two ribs. This test, called a thoracoscopy, is done in the hospital. Prior to the test, the patient is given a local anesthetic. Some pressure may accompany this procedure, but usually there is no pain. The doctor may also look inside the abdomen with a special tool called a peritoneoscope. This is called a peritoneoscopy. This test is also performed in the hospital with a local anesthetic. Paracentesis is a related procedure often used in diagnosis. If, during these tests, tissue is found that is not normal, the doctor will cut out a small piece to be examined under a microscope. This is called a tissue biopsy. The tissue will then be sent to a pathologist to diagnose disease.